The conversation surrounding green energy, generally, and solar power, specifically, can be daunting. It isn’t every day you decide to rely on the sun for power. How is that even possible? What are the effects, whether positive or negative? Can I invest in a home solar power system and remain comfortable? 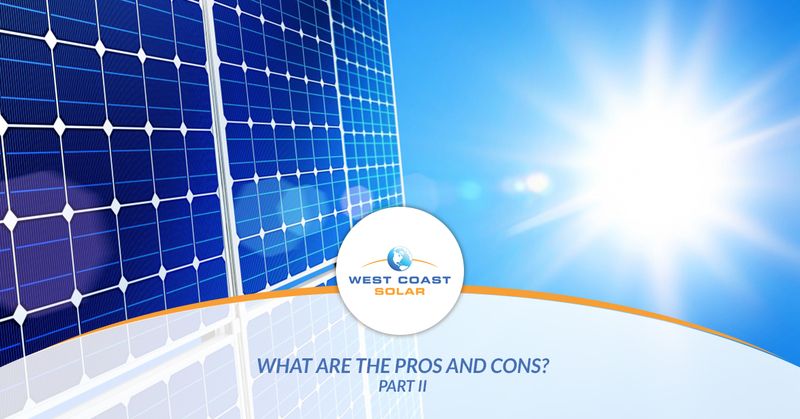 West Coast Solar strives to keep solar simple and answer all your questions. In part I of this blog series, we discussed the general overview of solar in the world now, and in part II we will discuss the specific pros and cons as we see them in the world today. Now that you have a better picture of what the green energy sector looks like, let’s review some of the common pros and cons of electrical energy. Development: The cost is high to continue research and manufacture new alternative energy resources compared to the already established fossil fuel sources. Sustainability: Although renewable energy is named because of the clean energy resource being tapped into like sunlight or wind, it’s also vulnerable to the weather. Slow or no winds could mean no energy production via turbines. A string of cloudy days could mean less sunlight converted. Also, the changing climate could render some areas unable to produce certain types of renewable energy over time. Production rate: Unlike fossil fuels, renewable energy takes longer to produce energy. This means we either need to consume less energy or find a way to produce energy quicker. Limited: The use of renewable energy is limited by area and resource. For example, the winds of West Texas cannot be found in the same abundance in California. This means our energy production via renewable resources will rely on the environment and space available. Area: Wind and solar, specifically, require a large physical area to produce energy. Entire fields of solar panels convert sunlight into energy. Hundreds of acres of turbines convert wind into electricity. As a whole, we’re limited not only in where our renewable resource is accessible but in also the space it requires to be effective. The cons of renewable energy are important. They help us decide and determine how to move forward in advancing related technology. The team at West Coast Solar in Sacramento keeps the cons in mind, but we also focus on the heavily weighted pros when it comes to green energy. Price: having a direct tie to the market, fossil fuel supply influences the cost increase or decrease of the energy resource. If the cost of gas goes up, it’s most likely because the supply has taken a dip in recent months. If the price drops, the supply has increased to meet more of the demand. Renewable energy is consistent and constant in its delivery and production. This means green energy can influence stabilizing market prices, and it’s already doing this as it becomes more prevalent across the nation and around the globe. Renewable: As the name implies, green energy is renewable. It’s a byproduct of nature, which we take advantage of and convert into usable electricity. Fossil fuels are not renewable. If and when we run out of our supply, we no longer have access to them for use. Reliable: Do you remember a day when the sun didn’t shine and never returned? It’s a silly question, but it’s the basis of green energy reliability. The sun, the wind, the rotation of the earth has to exist or we don’t exist. It’s somewhat lofty to think of energy in this sense, but this is why renewable energy is reliable. It has always existed, and we don’t see it disappearing any time in the near or far future. Emissions: Renewable energy in some sectors does produce pollution. It’s negligible compared to fossil fuels, as in a fraction of a percent. Nonetheless, if we can develop and advance green energy far enough, the emission reduction can help the planet and the future generations of your family. Jobs: As the electric energy sector grows, so do the demand for employees. It is a tough transition to move a fossil fuel job to a green energy job, but it can be done. More jobs are surfacing every day in the green energy sector. The bill essentially protects those selling their solar or wind energy back to the utility companies. It “sets forth provisions governing the issuance, tracking, verification, trading, banking, and retirement of federal renewable electricity credits” to be reported to the Federal Energy Regulatory Commission. The bill also allows states to set the rate at which electricity is sold. A huge benefit to renewable energy is the ability to distribute out what you don’t use to others who may need it at a fair rate. Whether you’re looking for an alternative energy source to fossil fuels, or want an entirely new solar power system for your home, West Coast Solar can help. We believe in the future of green energy, and we want you to know we’re just as invested in this approach to help reduce carbon emissions, deliver clean energy to our customer’s homes, and create a better tomorrow for future generations. Read part I of this series. Want to discuss solar? Give us a call!